Unlike the well-known furry variety, USS Constitution‘s many mouses are lumps of line and canvas built up on the outside of the diagonal stays that run between the masts. The mouse prevents the stay, which is looped around the mast and secured with an eye splice, from tightening up on itself. In Constitution‘s 1992-1996 restoration, several mouses were re-introduced to the stays between the masts. The Naval History & Heritage Command Detachment Boston riggers followed late 18th and early 19th century rigging techniques to “raise” each mouse. The Young Sea Officer’s Sheet Anchor by Darcy Lever, originally published in England in 1808, was used as a guide to re-create the rigging mouses needed to secure the diagonal stays between the masts. Illustrations on page 10 of The Young Sea Officer’s Sheet Anchor…, by Darcy Lever. Fig. 83 shows a mouse with the exterior lines ready for weaving. Charles Ware’s 1817 sail plan of Constitution clearly shows mouses on the stays between the masts. By the end of the 19th century, Constitution‘s standing rigging was wire rope and did not require mouses. 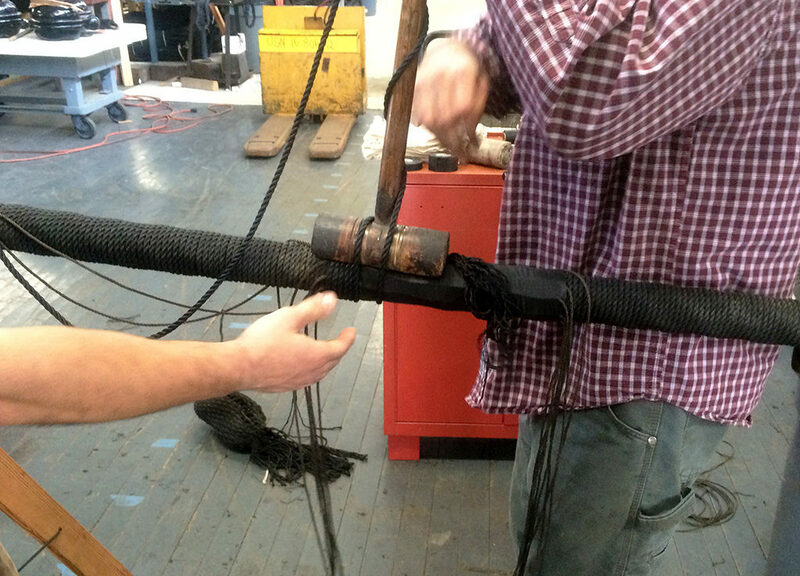 The wire rope was spliced back in on itself to create the loops needed to go around the masts. In the re-rig of the 1927-1931 restoration, natural hemp fiber was used for the standing rigging. 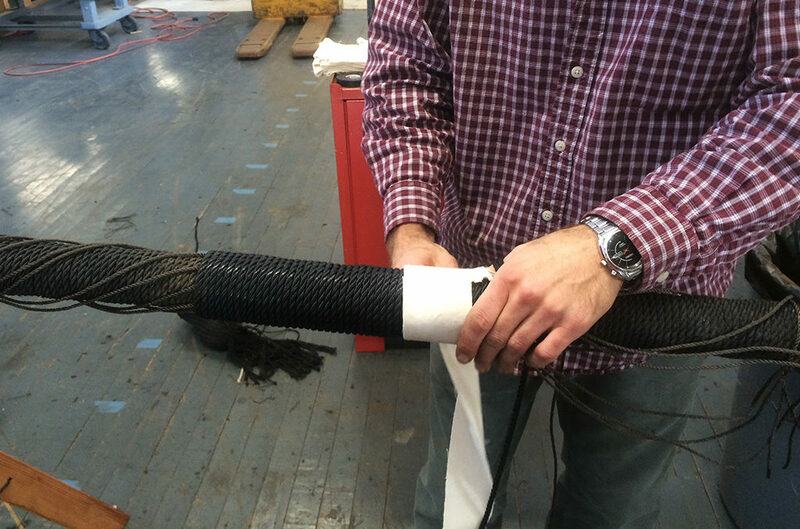 The Navy Yard riggers again did not use mouses. 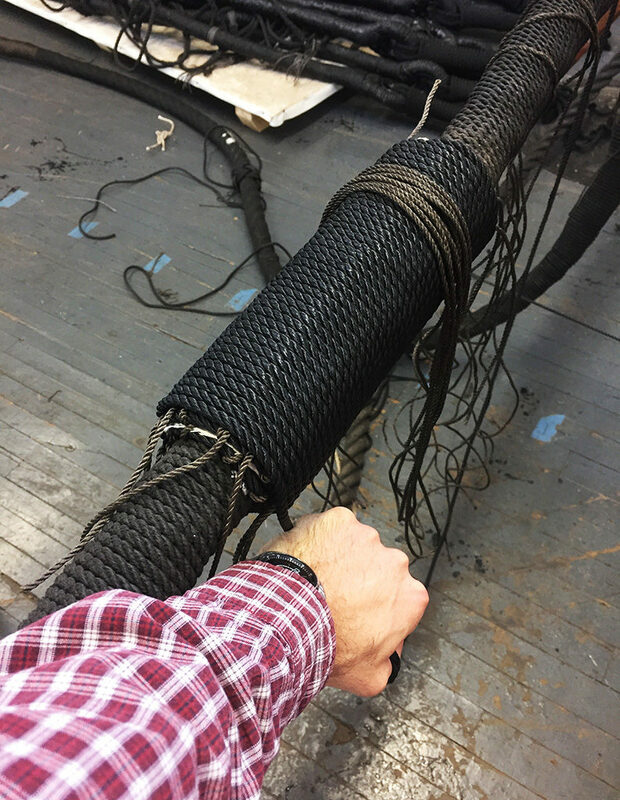 Instead they spliced the hemp to make the loops, similar to the way it would have been done with wire rope in the late 19th century. 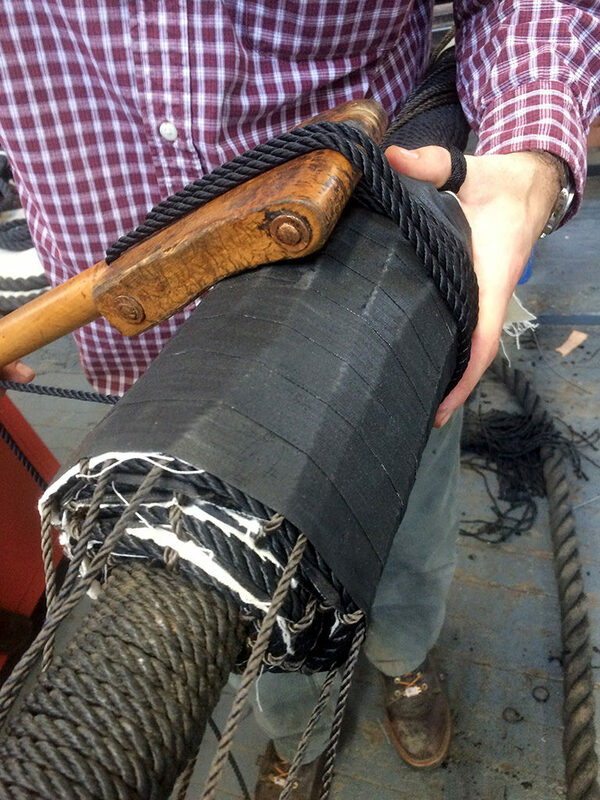 It is likely that the 1930 Navy Yard riggers were more familiar with splicing wire rope than hemp. 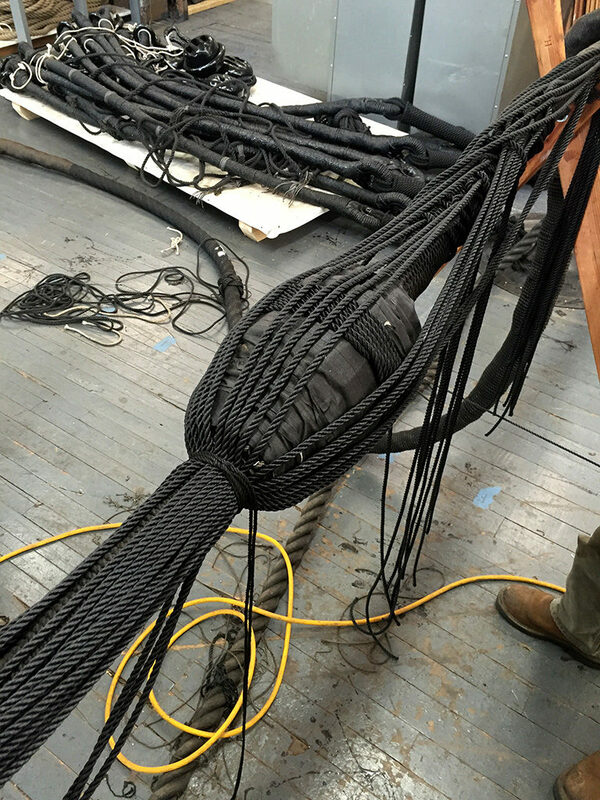 Therefore, when it came time to make up Constitution‘s standing rigging, they spliced the hemp as if it were the more familiar wire rope. Since the 1992-1996 restoration, when the standing rigging was changed to spun polyester, the diagonal stays between the masts have carried mouses. The mouses have short lifespans as the pressure of the eye splices causes them to collapse over time. 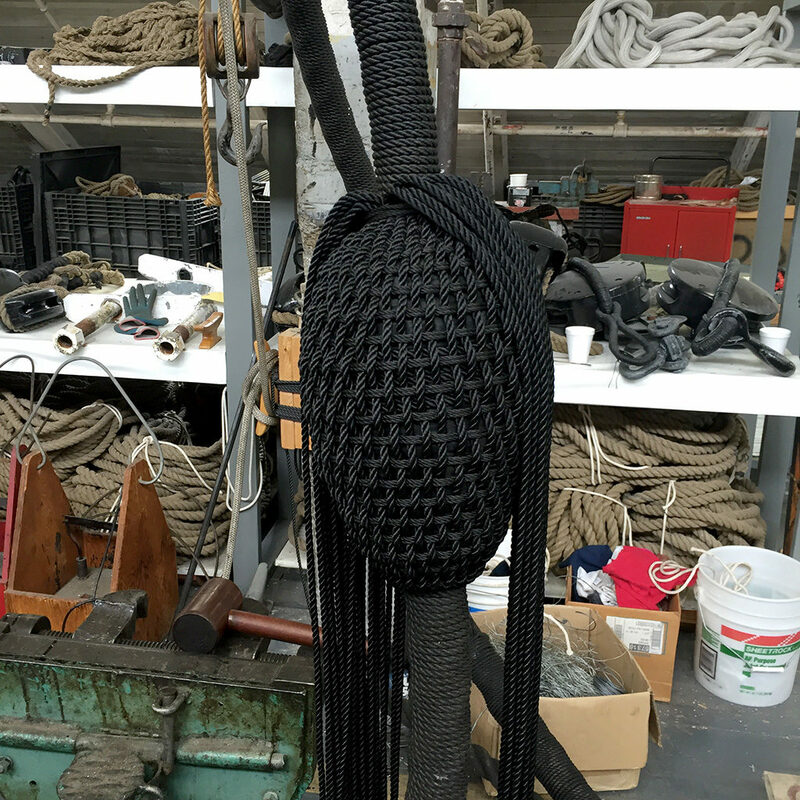 The mouse on the mizzen preventer stay required full replacement during the 2015-2017 restoration. NHHC Detachment Boston riggers Ryan Whitehead, Jose Hernandez-Juviel, and Timothy Burns worked in raising the new mouse on the stay in the rigging loft of Building 24 in the Charlestown Navy Yard. The mouse was completed in May 2016 and installed on the ship in June. The photo series below shows each major step in the process. The new mouse should last several years, but will likely need replacement before Constitution‘s next dry docking in approximately 20 years. Next time you visit Constitution and look up in the rigging, try to spot a mouse!